CSI comes to life on your PC with all the cyber-Sherlock Holmes appeal fans know and love. The high production value of the game and its faithful adherence to the theme, style, and sound of the show will please fans. 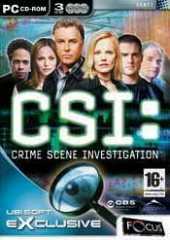 As you'd expect, CSI is a mystery adventure game that follows the format of the CSI show. You collect evidence, head to the lab, visit the morgue and so on. You scrutinize the game's screens, looking for evidence or areas that may contain hidden clues. You can use Luminal to find blood traces, you can dust for prints, and you can use the sniffer to get gas samples--all are familiar tools and methods used in the show. CSI fans will likely intuitively know when and where to use each item while adventure game fans will delight in having such new, high tech toys. CSI offers five quality storylines, each of which would feel at home on the show. While you don't get to fill the shoes of one of the show's well-known characters, you do get to work with each of them as you progress along the CSI investigative chain. Show characters join you to provide hints and help you establish the motive, means, and opportunity needed to determine and catch the bad guy. Fans of the show will forgive the short length of the game and merely adequate graphics just because of the quality storylines, use of the real actors, and respect shown the license. Travel through the dark, seedy side of Las Vegas, as you work alongside Grissom, Catherine and the rest of the CSI team in this thrilling first-person adventure. Put your thinking skills to the test as you question witnesses and examine crime scenes. Analyze evidence you collect utilizing the latest in forensic equipment. There's five crimes to investigate and solve.